Kippure Estate in Co. Wicklow has a rich history that dates back to the 1700s. Originally owned by the Moore family of Kilbride, it was extended into a hunting lodge, along with a farm and Victorian walled garden. The estate was destroyed by fire in the early 1900s but revamped in the 70s. On the grounds, there are ruins of old huts, standing stones and other fascinating things that hint at the world that once was. Surviving in the wild is not easy – not only do you have to weather yourself against the elements, but you also have to find a way to sustain your energy too! This survival series looks at the many wild foods that you can come across on your travels, that you can safely forage and snack on when you need to. A succulent plant that can be found in many countries, purslane is a very rich source of omega-3 fatty acids which strengthens the immune system. You often find this delicious plant in driveways and footpaths but they also tend to crop up in all sorts of gardens, fields and roadsides. With a distinctive thick and reddish stem, this plant is easily recognisable and what’s great is that you can eat the leaves, stems and flower buds! It’s said that purslane “provides six times more vitamin E than spinach and seven times more beta carotene than carrots”. Purslane can be snapped up and used in salads or sprinkled on top of any dish – it’s really tasty, trust me! As with all foraged things, cross-reference any food before you pick it up and don’t forget to wash it thoroughly before consuming. Heading out to the beach this week and looking for something wild to bring home? Look no further! Though some may flinch at the idea at cooking and eating snail-like creatures, these little molluscs are perfect for a quick protein boost. The only problem with them, is that they’re a bit fiddly to eat. Periwinkles are really easy to find and forage, and identifying them should be no problem at all. They can be commonly found on the seashore by rock pools and all you need to bring with you is a small carrier bag. Identification is also quite simple, basically you’re looking for periwinkles that are darker in colour (I think they’re tastier!). They will also have a round opening. The best way to eat periwinkles is to cook them in sea water so that they keep their wonderful salty flavour, then with a needle, skewer the inside of the periwinkle and pull it out to eat. You can also combine them with another foraged ingredient and steam them with wild garlic! As always, be careful when foraging and make sure you don’t gather food from a source that is close to a sewage line. Walking across woodlands and along old ruins and walls, my inner forager leaps into action. Don’t let this mushroom’s ominous-sounding name deceive you – it’s actually a very safe one to eat. A horn or funneled-shaped mushroom with a rough, and crinkly dark brown cap, the horn of plenty can be found in the woods but especially in autumn. It can be found in North, Central and South America, as well as throughout Europe and Asia. The mushrooms have no gills and their caps’ undersides will always be smooth or slightly wrinkled. They’re cousins to chanterelles and are often called “black chanterelles” given their similar shape. Tasting far better than it looks, when cooked this mushroom can be made into a lovely mushroom sauce, added to a wild mushroom soup or used in a risotto. 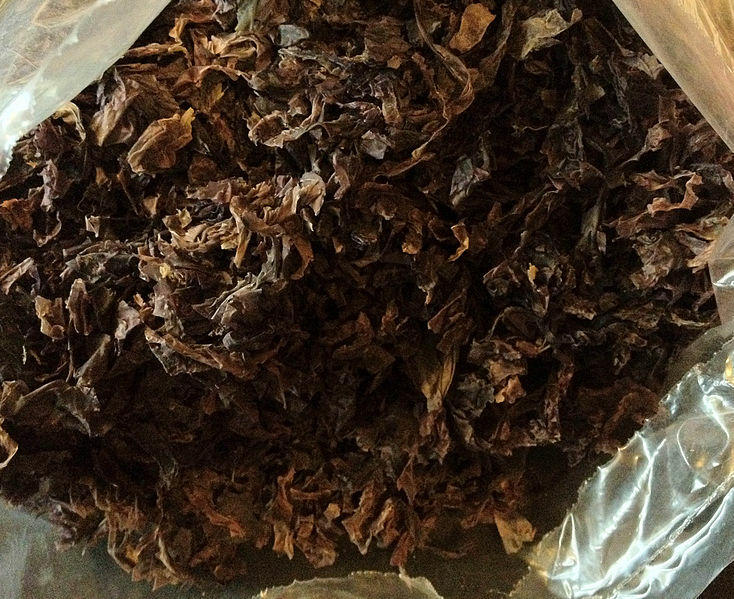 It has has a rich and smoky taste and dries very well. Horn of Plentys are delicious but unfortunately are not the easiest mushroom to find as they blend well into the woodland floor – so keep an eye out! They love hardwood forests, particularly if there are beech or oak trees around and also have a tendency to grow in clusters. As with all foraged mushrooms, it’s vitally important that you can identify them with complete certainty before eating them. Mushrooms are the type of food that prefer to breath so if you’re foraging, it’s better to store them in a paper bag or basket rather than a plastic bag; if it smells rotten and soggy, don’t pick it up. 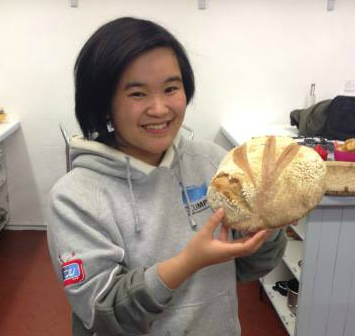 Wild food, ahoy – Grab your buckets and scissors, we’re off on another seaside adventure! Also known as dulse, this algae species is mostly found in the middle to lower shore. Characterised by its red or purple colour, it can be found in many parts of Europe and the North Atlantic Coasts of America usually attached to rocks by means of a holdfast. Dillisk can grow between 25cm and 45cm in length and is normally harvested during spring and summer. It’s a rich and natural source of essential vitamins with high levels of ruffage which is perfect if you’re looking for a nibble along the sea shore! A wild food that’s very common on the west coast of Ireland, it doesn’t require soaking or cooking. I personally love just popping a bit of dried dillisk into my mouth and chewing on it but you can also add it to salads, use it as a change to salt in soups or even drop it into a cake. As always, happy foraging and don’t forget to source sustainably! If you’re a fan of foraging food and finding edible treats in the wild, this series is for you. For those who’ve been following this blog they may have noticed that I have a love for zombies and post-apocalyptic scenarios and so, this is how the survival series was born! This popular sea vegetable is used in many Asian countries and people may be most familiar with it from sushi where it’s often seen wrapped around the sushi rice. A red algae, it’s also known as purple laver or black butter. It’s the most widely consumed seaweed in the world. It grows in thin layers and sticks to rocks in the upper shore where it resembles black plastic sheets – easy to overlook if you’re not careful. You can lift the seaweed directly from the rocks in sheets or ribbons. It’s a wild food that’s rich in vitamins A, B1, B2, B12 and E and even contains more vitamin C than oranges – a handy snack if you’re jumping from rock-to-rock. Apart from using processed nori in wrapping sushi, I’ll happily nibble away at it as a snack. Forget crisps, this is a real treat. To dry the nori out so you can rehydrate it later, simply leave it out in the sun or as I learned recently from Darach Ó Murchú, you can leave it out on your car dashboard. As always, happy foraging and only take as much as you need. Nature will love you for it! Foraging and finding food in the wild can be quite exciting and when you learn what to look out for it starts to become more than hobby and more like an addiction. 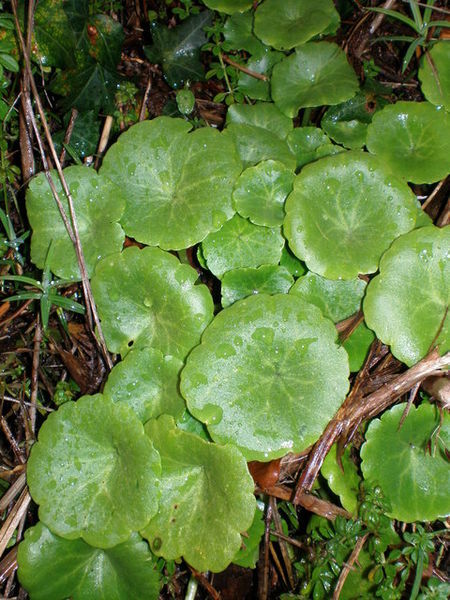 Also known as Navelwort, this bright green bite of the wild can be found in many places across Ireland. A fleshy plant, it’s so named for its umbilicate (or navel-like) leaves. Found on cliffs, stone walls and stony banks, it has quite a distinctive look and can be enjoyed simply by plucking off the leaves and popping them into your mouth. From June to September, you’ll see pennywort with large bell-shaped flowers that veer upward into a spiral. According to Kerry folklore, the perennial plant was “known to be a cure for corns”, though I’ve yet to see proof of that! This plant is perfect as an addition to any salad as it gives a juicy bite to the rest of the leaves. It has a lovely texture and makes for a nice contrast against the softer plants. Easy to snap up if you’re in a hurry, it’s no wonder that this little plant is also known as “bread and butter”. Happy foraging! With a fascination for the apocalypse and survival, it’s natural that I’d have a love for wild food too. Each week I’ll feature a natural food resource that can be found lurking where you least expect it. See it as a guide for when things start to go down; if anything you’ll be prepared! This week we’re moving onto mushrooms. But be warned, you should always have at least three wild food books with you to reference what you’re eating (particularly with mushrooms as many of them are deadly). 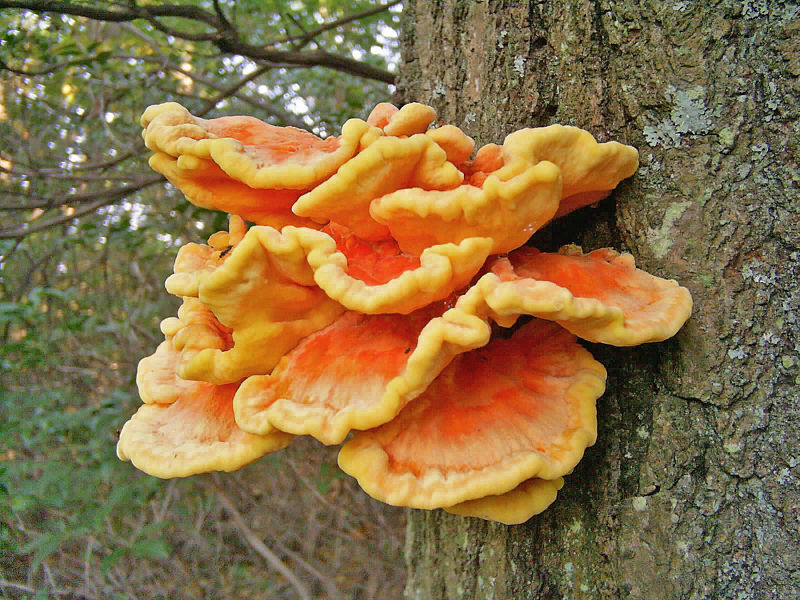 Laetiporus sulphurous or Chicken of the woods with its orange or sulphur-yellow colouring, is hard to miss. This impressive fungus is often seen, you guessed it, in the woods on trees such as beech, oak, chestnut, yew (less so on hardwoods). Don’t harvest this mushroom if it’s on a yew as this tree contains dangerous toxins that could be taken up by the fungus. The young brackets of this mushroom are soft and spongy but as they age they’re thinner and paler. You can usually find them from May to October and they’re best picked when young and moist. One popular way of cooking these delicious, golden, bites of chickeny goodness, is to cut them into chunky slices and sauté them with a little oil, garlic, salt and pepper. For those who are looking to buy chicken of the woods from a reliable source, check out Ballyhoura Mushrooms who are Irish growers of specialist and foraged mushrooms. Remember, never eat a wild food that you can’t 100% identify, it’s not worth your life.